You can find our small campingsite including two holiday chalets, in the southwest of Burgundy, the Nievre. On our campsite we have four terrasses of each a 100 m2. 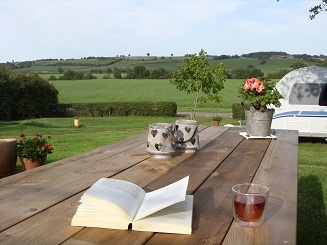 From each terras you have a panoramic view over the hills of Burgundy. The chalets, Le Soleil and La Lune, are well equiped and arranged for four persons. Our campsite is especially for those who like quietness and space. You can hear the birds sing and in de early morning or late evening you see the roe-deers run through the fields.